When I went to Europe last year, for what became The 2016 European Museum Tour with my cousin, I needed a new bag. Never one to just make a purchase randomly, I researched. I needed something that would be sturdy to survive cobblestone streets but could also be used as a backpack if I needed it to. I also really wanted a detachable daypack. 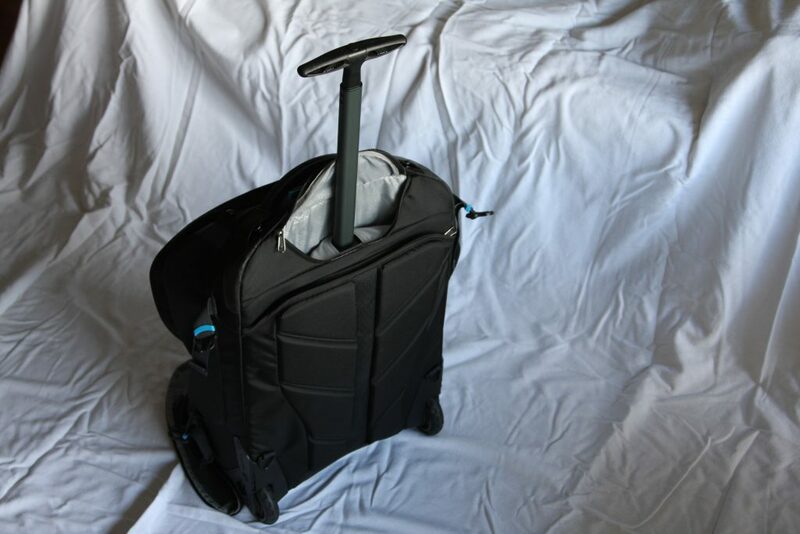 After a bit of research, I happily found and purchased the Eagle Creek Doubleback Carry-On wheeled backpack. I needed a small, lightweight bag that would be durable enough for the cobblestoned streets of Europe. I know I tend to be a bit rough with my belongings but I find wheels on luggage, never seem to survive as long as the luggage does. And that is on regular pavement, and in airports. You add uneven, cobblestone streets to the mix that appear to be crazy strong seeing as they have been around for hundreds of years, and you have luggage that doesn’t survive your vacation. From experience, I really wanted a bag that also had a detachable daypack. I rarely carry a purse when I travel. I always feel as though a purse is a giant beacon to thieves. It screams, oh look, money. Especially in Europe where there are so many crowds of tourists and probably half as many thieves. With a daypack, you can throw a jacket in there, a battery back-up phone charger, a bottle of water, a snack, a big DSLR camera, and almost anything else you want to carry all day. You can wear it on your back, or for times when you are in a crowd, you can wear it in the front. For this trip, I needed a bag with wheels but for future trips I might need or want a backpack. I felt buying a bag that offered both options was the way to go. I found it with the Eagle Creek Doubleback Carry-On wheeled backpack. The bag is soft like a backpack but has a firm back panel like a suitcase. It also has a ¾ zipper so only the bottom can’t be undone. Which allows you to open the entire front of the bag. Plus, besides straps inside the bag, there are straps along the sides on the outside, so you can tighten it once the bag is zipped up. Preventing a lot of movement with your belongings. There is a zippered mesh pocket on the front flap inside the bag as well as a small zippered pocket on the top, outside of the bag. 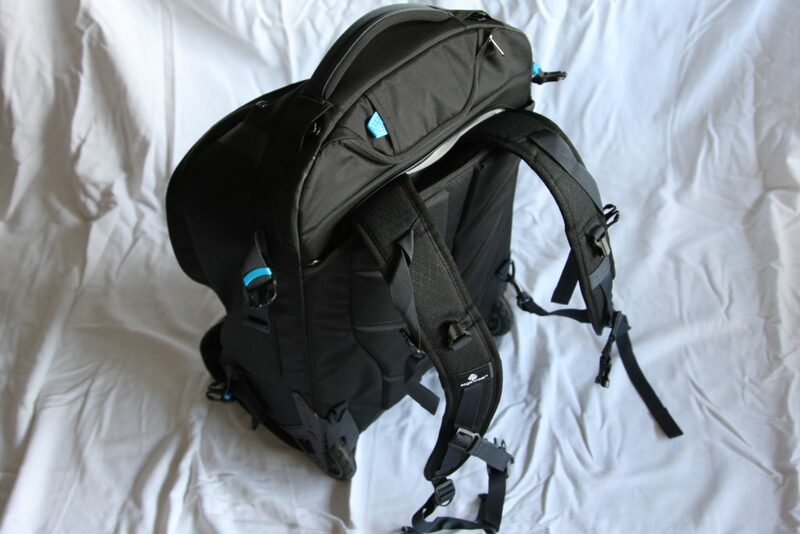 The Eagle Creek Doubleback Carry-On wheeled backpack can be used with the wheels and the handle, the straps as a backpack, or as a duffle bag with the two handles located on the top and one of the sides of the bag. I thought the handle felt a bit weak at first so I was worried, but so far it is still going strong and I have not had any problems with it. The handle sits atop one extendable bar. Having two extendable bars would have been more durable but like I said, I haven’t had any problems yet. Like most suitcases with a retractable handle, you lose valuable packing space inside that suitcase. This wasn’t a big factor for me, I just changed how I packed my clothes. I haven’t used this bag as a backpack yet while traveling but I have put it on. 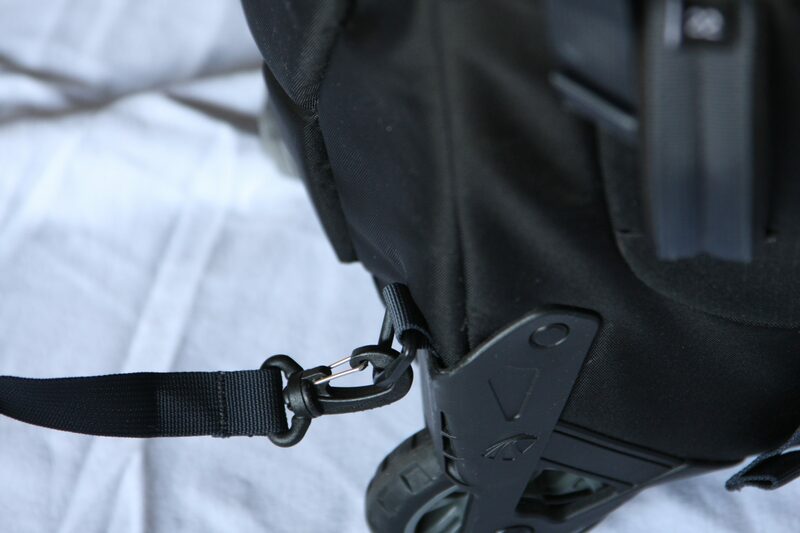 The straps fold up easily into a panel on the back of the bag that zips shut. You can’t even tell it can become a backpack. You also have to clip them into place and adjust them for your body so I recommend setting it all up before you leave. That way if you have to use them, they are ready to go. I thought the wheels might dig into my back but when I tried it out, I didn’t feel them at all. The Eagle Creek Doubleback Carry-On wheeled backpack is created for simplicity and comfort. Eagle Creek creates all sorts of bags for travel so they know what they are doing. 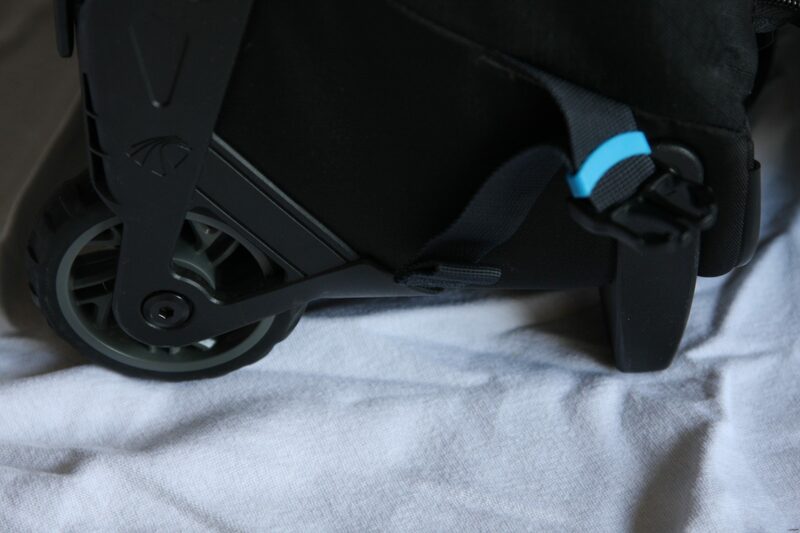 The wheels are more rugged than most and designed to survive what you can put it through. I can tell you they survived my two-week vacation travelling between three European cities. Planes, trains, automobiles and even cobblestones. They also survived three months traveling around Australia and New Zealand. The daypack was an awesome addition and exactly what I was looking for. It is a great size with a small pocket on the front. Inside the bag there is a small zippered pouch for a few small things. There is also a larger pocket section with an elastic top. Traveling can be exhausting but thankfully the daypack has a mesh pocket on each side of the bag for small water bottles. The bag has reflective strips on it and it even has a covered hole on the back so you can carry your camelback inside. 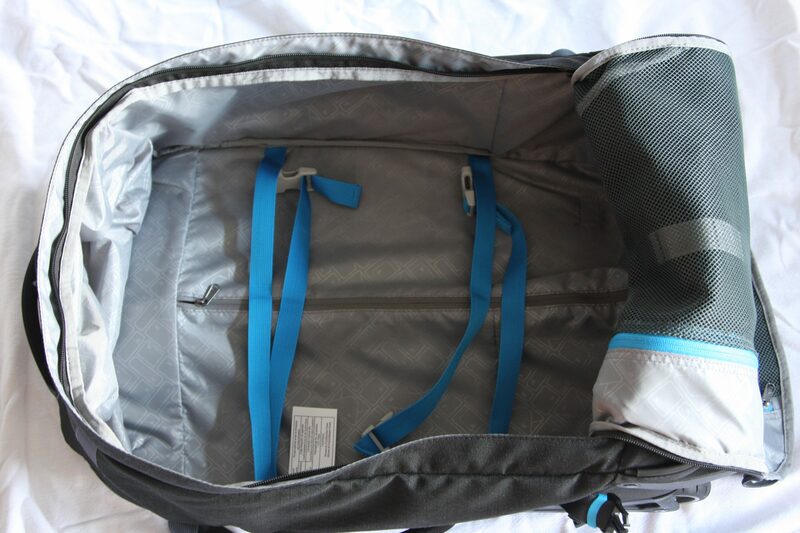 The straps can be tucked into a flap for when you don’t need them or you are attach it to the larger bag. Overall, I love this bag. I find it to be durable and a great size. 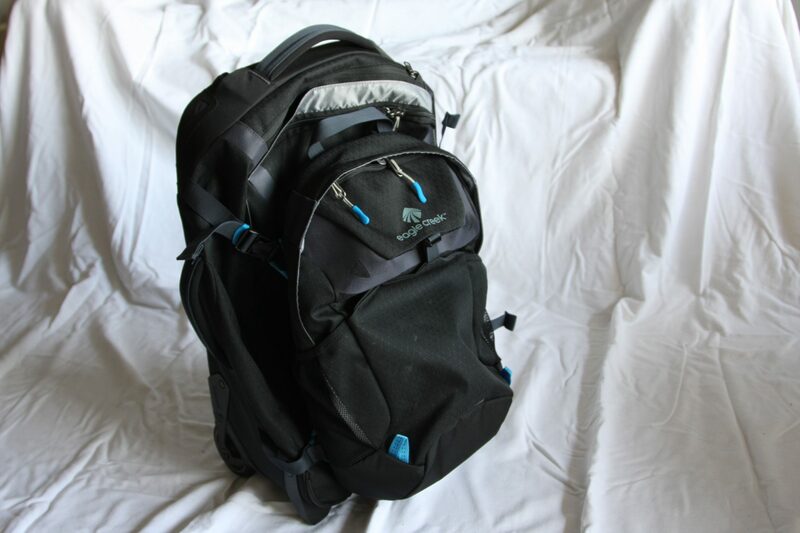 The main bag is 39.5L and the daypack is 18L. Eagle Creek has the most awesome life-time, no matter what warranty too. Seriously, you get repair or replacement from product failure, for the product lifetime, no matter the cause. The zipper on my daypack was starting to separate from the flap while I was in Australia. I came home, sent an email and was told to send it to the nearest location for repair. The nearest location wasn’t too far from an appointment I had one day so I dropped it off. This shop does the repairs for Eagle Creek but they aren’t part of the Eagle Creek company. When they found out where I lived, they said they would have the repair done for me as soon as possible. It took them about ½ hour. I was very impressed and appreciative. And it was all free. If you are planning a trip, or want to plan a trip, you can check out the Services & Investment page for packages we offer in that area. There are also different products on the Yup…..We Like These page.